The table shows the total amount of rain that falls in various amounts of time during aheavy rain. If "x" denotes time and "y" denotes total amount of rain, then the relationship between time and total amount of rain can be represented by the equation y = 1.5x, The graph of the relationship will be a line, so the equation is a linear equation. Since there is exactly one value of y for each value of x, the relationship is a linear function. The temperature at dawn was 8 °F and increased steadily 2 °F every hour. The equation y = 2x + 8 gives the temperature y after x hours. State whether the relationship between the time and the temperature is proportional or non proportional. Then graph the function. The given equation y = 2x + 8 is in slope-intercept form linear equation. That is, y = mx + b. When we compare the equation y = 2x + 8 with y = mx + b, we get m = 2 and b = 8. Therefore, the equation is a linear equation. Since b ≠ 0, the relationship is non proportional. 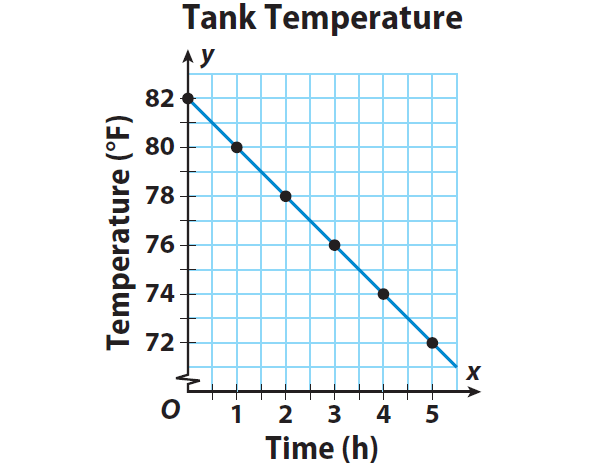 The temperature of a fish tank was 82 °F and decreased steadily 2 °F every hour. 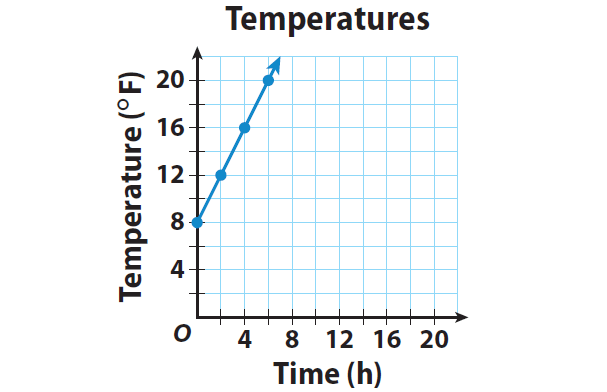 The equation y = -2x + 82 gives the temperature y after x hours. State whether the relationship between the time and the temperature is proportional or non proportional. Then graph the function. The given equation y = -2x + 82 is in slope-intercept form linear equation. That is, y = mx + b. When we compare the equation y = -2x + 82 with y = mx + b, we get m = -2 and b = 82. After having gone through the stuff given above, we hope that the students would have understood "Graphing linear functions".